Our God is magnificent; beyond words to describe, right? There are no boundaries to his greatness, splendor, and righteousness. Among his glorious attributes are power and wisdom, grace and mercy, goodness and love. These lofty thoughts and more about the King of the universe are poetically presented in Psalm 145. 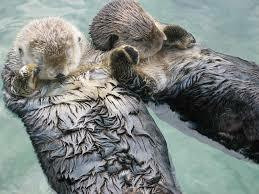 Slipping, sliding otters. Leaping, somersaulting dolphins. Swinging, scratching monkeys. They make us laugh–might they not bring great pleasure to God, especially since he made them? And have you ever seen young gooney birds learning to fly? Their tumbly landings in particular are hilarious! Get this: God spoke through a donkey once to get the attention of a sorcerer named Balaam (Numbers 22, 23). In case you’re not familiar with the story, I repeat: The donkey did the talking, speaking the words God gave her (22:19). Imagine the look on Balaam’s face! If we had been there, I’m sure we would have been stifling our guffaws. Might God have been chuckling a bit, too? In the book of Job, God used the example of an ostrich to help Job understand the Lord’s sovereignty. As you read this description, visualize the scene as if portrayed in a cartoon. 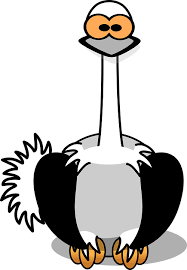 Give the ostrich a doltish expression to enhance further the humor-factor! “The ostrich flaps her wings futilely—all those beautiful feathers, but useless! She lays her eggs on the hard ground, leaves them there in the dirt, exposed to the weather, not caring that they might get stepped on and cracked or trampled by some wild animal. She’s negligent with her young, as if they weren’t even hers. She cares nothing about anything. She wasn’t created very smart, that’s for sure, wasn’t given her share of good sense. But when she runs, oh, how she runs, laughing, leaving horse and rider in the dust (Job 39:13-18, The Message). Proverbs also includes a number of lessons taught with humor. “Like a gold ring in a pig’s snout is a beautiful face on an empty head” (Proverbs 11:22). 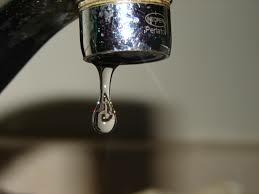 “Knowledge flows like spring water from the wise; fools are leaky faucets, dripping nonsense” (15:2). “The words of a fool start fights; do him a favor and gag him” (18:6). “Valuables are safe in a wise person’s home; fools put it all out for yard sales (21:20). “Like billowing clouds that bring no rain is the person who talks big but never produces (25:14). A number of Jesus’ stories and teachings included humor. One example is Matthew 23:24. “You blind guides! You strain out a gnat but swallow a camel,” he said to the religious leaders. They were so careful about following unimportant rules, yet ignored important issues like humility and kindness. Where’s the humor, you ask? It’s hiding in the translation, from Aramaic to English. 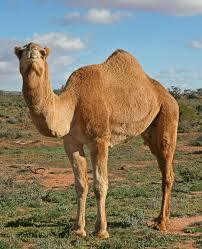 The Aramaic word of gnat is galma; the word for camel is gamla. Jesus used a play on words! There are more examples we could enjoy, but that’s enough for one sitting. And now you may be asking why it matters if God has a sense of humor or not. The more we know about God, the more we discover to appreciate. The more we appreciate our God, the more we’ll want to be in his company and worship him. And we are made glad with the joy of his [delightful, cheerful] presence (Psalm 21:6). Humor allows each of us to go outside of our problems. God loves us so much that He shows that by giving us this gift. When we see humor in His creation we understand that He is a,ways there for us no matter what problems come our way. Yes a sense of humor is a wonderful gift. Oh, yes, Loraine. Agreed! Thank you, Lord, for giving us a sense of humor, to enjoy your world with increased delight! ‘So glad I can make you smile, Jody! Love this posting. The humorous side of God! Inspired! My favorite part was about the gnat and camel. So true and loved the play on words. Thanks for making me laugh with this one! So glad you enjoyed the post. I love that God has a sense of humor, too!